In Second Life I found the ALM Cyberchurch run by Benjamin Faust who was the pastor there and a pastor in the physical world as well. I asked him if I could rent space on his simulation from him and be the church evangelist there, such as I do in life. It was there I ran a virtual café and started doing evangelism in Second Life. We worked together well. I was curious about Second Life for professional reasons, though, and my curiosity was overwelming. 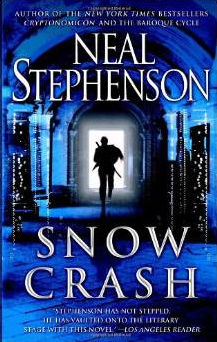 This kind of technology was talked about in a cyberpunk novel called “Snow Crash” which depicted a 3D Internet environment called “The Metaverse”. I went back to that article in PC World magazine to find the key professional contact mentioned and found the name Ron Blechner. It was my intention to speak with him. I found out that he was located in New Jersey like I was. He was near Manhattan. I investigated further because I needed to find the virtual reality guru of Second Life. Realizing such people generally send out esoteric symbols, I looked on the web for this. I found a picture of a male avatar wearing a teeshirt saying “Google” with Second Life symbols for the Os and realized that I had found him, Jerry Paffendorf. Jerry authored a paper titled “The Metaverse Roadmap”. When I looked into where he was located, I found out that he was in Brooklyn, New York. I thought to myself, “I’ll just bet you that these two guys know each other since they are both in the same area. They meet somewhere. But where?” After looking on the web further I found out about “Metaverse Meetup” in Brooklyn. This was perfect! All I had to do was go there and meet them on casual terms, which I did and ended up attending their meetings in Manhattan and Brooklyn regularly. There was the distinct possibility of the internet truly going 3D because even major corporations were investing into the creation of simulations representing their businesses in Second Life. The year 2007 was a boom year for Linden Labs, the creators and host for Second Life. At the Metaverse Meetup we were in the prime seat ready for a major boom, however, what we did not know was who was going to invest what money where. If we knew that, then we would have gotten into stock investments. So we watched and geared up our careers primed for a changing world. 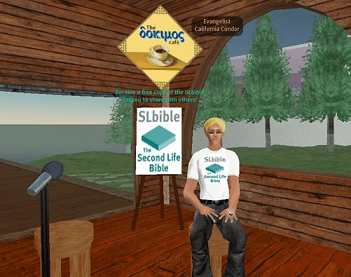 In Second Life, I created a Scripture on-command chat utility called the “SLbible” which I gave out freely. All someone would have to do is attach the item to their avatar and type something like “/90 JOHN 3:16-18” then the entire Bible passage would display in open chat. Christians especially liked this because it helped them do various activities in Second Life such as church, bible studies, evangelism, or other Biblical discussions. The SLbible spread rather quickly, which I further promoted with advertisements. This also helped me share the gospel quite a bit in Second Life since also I designed this to show Holy Bible verses in various translations and languages. More recently, I visited Second Life and found the SLbible still being used. During those days at Metaverse Meetup a film crew came out to video tape us. They were preparing to make a movie but were making short videos. This time it was a video they titled “Nerdcore Rising: The Second Life Nerd”. Many of us at Metaverse Meetup were being video taped. I was taped for half of an hour. Actually, I only said one sentence with the actual gospel while most of the time I spoke on Second Life and Metaverse. When the video was released onto YouTube I saw it where I was in one scene and speaking only one sentence. I said, “Oh! I’m in the video.” Then I said, “Oh my! They quoted me when I shared the gospel!“. The showed me speaking when I spoke about ALM Cyberchurch ministry and myself by my saying “We share the gospel of the good news of the free gift of eternal life and forgiveness of all your sins through trusting faith in Jesus Christ through Second Life.” This video of all of us went viral on the web. I was used to going to tech meetings but this one was getting fun so I invited my wife to come with me. With others, I started running an additional meetup called the “New Jersey Metaverse Meetup”. It was during these days I had a dream. I saw a popular professional person in Second Life named Tim Allen. In my dream he held a Second Life chained emblem. I saw others wear this who were in Second Life in its older days, which you couldn’t get anymore. In the dream he held one, placed it around my neck with me saying, “I’ve been collared!” Shortly after this at a New Jersey Metaverse Meetup, Tim Allen came and without my being told about this, except by God in a dream, he did exactly what I saw in my dream. The year of 2008 was the start of the decline of the mass popularity of Second Life. Linden Labs came up with restrictive policies that disfavored businesses in Second Life which discouraged investors. Metaverse Meetups were still going on during this time while Camelot had fallen. The hype for Second Life and Metaverse was declining which matched up with Gartner’s diagram for the Hype Cycle of Emerging Technologies. The Hype Cycle showed about emerging technologies developing a strong rise and fall followed by a developing increase. This happened with Second Life. Second Life came back on the increase in succeeding years with a larger user base than ever before. Still, big businesses pulled out. I pity those people who were trouble-makers in Second Life of whom some had trouble getting over their own bitterness. The dream of Metaverse rising above the World Wide Web has NOT come to a halt. Forbes.com on March 26th of this year, 2014, posted an article titled “Mark Zuckerberg Wants To Build The Metaverse, And That’s OK“. Other new platforms also have been rising. We still need to ask where this all will lead. Unfortunately, my pursuit of Metaverse did not gain the boost in my computer career as much as I hoped for, but it could have happened. However, I did get to meet a large number of people, including when I traveled to the Second Life Community Convention which I did for two years. All of this did give me excellent opportunities to share with many the gospel of Jesus Christ. Not only sharing the gospel in Second Life but also with a good number of people in the physical world as well. I praise God in Jesus’ name for the many happy memories of these times.